My discovery of Maugham is entwined with my discovery of College Street at Kolkatta and I can’t describe one without the other now. I had heard a lot about College Street at Kolkatta but it turned out to be even better than the description. True that unlike Daryaganj, the street is not very long and most of the vendors are selling books for college and competitive exams but when I finally spotted one vendor selling novels and picked up a Somerset Maugham lying there, he got me all the Maughams he had and it was difficult for me to choose which ones among them I should pick. Then I spotted a Tennyson- Complete Works, he sold it to me saying that it is a collector’s item. I was so happy that he actually knew who Maugham and Tennyson were and was not selling the books based on the thickness. 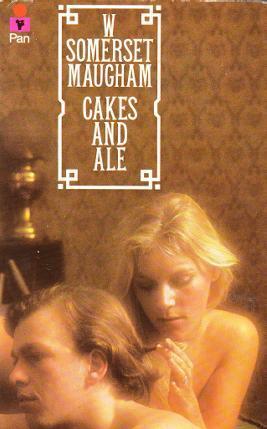 Cakes and Ale was one of the Maughams I had picked up from the shop- published in 1976 and first bought by someone in 1986, hence a prized possession for me. The opening preface by Maugham itself got me hooked on to the book. I love how he tries to explain as to how the book fell into controversy as it was considered to be about some authors whereas he says it was mostly autobiographical taking inspiration from some living personalities. The most striking part of the book is the satirical description of the literary world- facetious and fickle, wherein the success of the book is more dependent on the marketing of the author and the book and not on the content of the book itself. The only person non-conforming to this facetious world was Rosie Driffield- a promiscuous ex-bartender who has a childlike smile and a unique zeal for life. Like the characters of strong independent women created by other authors, Rosie was highly promiscuous and touched the life of everyone around her including the protagonist, who doesn’t think highly of any character in the book except Rosie. I wished the book would never end, but now that it has, I have a lingering urge to reread it or pick up another Maugham. A dreamer, spoilt by the world of literature trying to find her expression through Art and her sanity through traveling ! !